Good things come from small batches! Gluten free. Trans fat free. Gluten & wheat free. Low in sodium. Dairy free. Cholesterol free. Casein free. Low in saturated fat. Start your day with a nutritious bowl of our delicious gluten free granola or; sprinkle on yogurt or ice cream; a great energy snack by itself! It all started in the bakery of our natural foods market on Main Street in Glastonbury Connecticut. Since 1992 we have taken the highest quality natural ingredients and crafted them with care into culinary marvels for our friends and customers. By remembering the earliest secrets of our success, our reputation for producing handcrafted quality has been maintained to this day. Hence, our motto: Good things come from small batches. 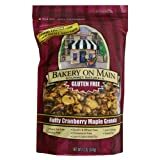 Our passion for great taste and commitment to good health has led us to create the Bakery on Main Gourmet Naturals line of premium gluten free granola. Gourmet Naturals means food that is good for you that tastes like it isn't. That's what we're all about-better health and happy taste buds living together in harmony. We hope you love our products as much as we love creating them. Thank you! Michael Smulders, Founder. It Doesn't Taste "Gluten Free"
It Doesn't Taste "Gluten Free"! It tastes great! This granola is crunchy and full of texture. You won't even be able to tell this product is gluten-free. Great as a snack or cereal. 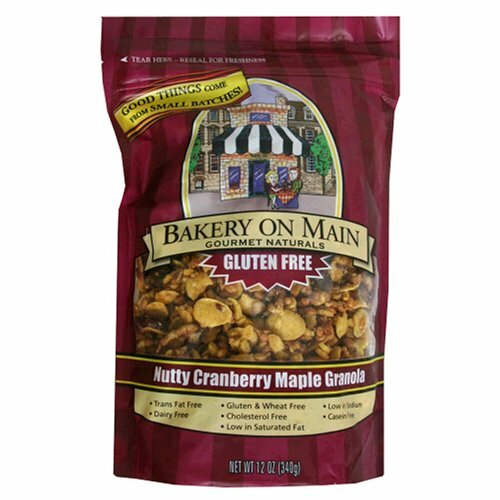 I purchased this product in hopes of finding a gluten free granola to replace the gluten variety I use to eat. It's not what I expected because I miss the oats, however it's great. I really enjoy the flavor, crunch and way it holds up in soy milk - something rare for a GF cereal. It has also been a lifesaver on road trips where I couldn't find GF restaurants to stop at. Very tasty product..good for you and tastes good..great combo. Excellent - Would definitely buy again!! This is wonderful snack food!